Since several of my patterns call for string blocks, I thought it was time to show you how I’ve made mine. Note; I am not talking about “quilt as you go” where you sew the strings to batting and a backing. That is a different technique. 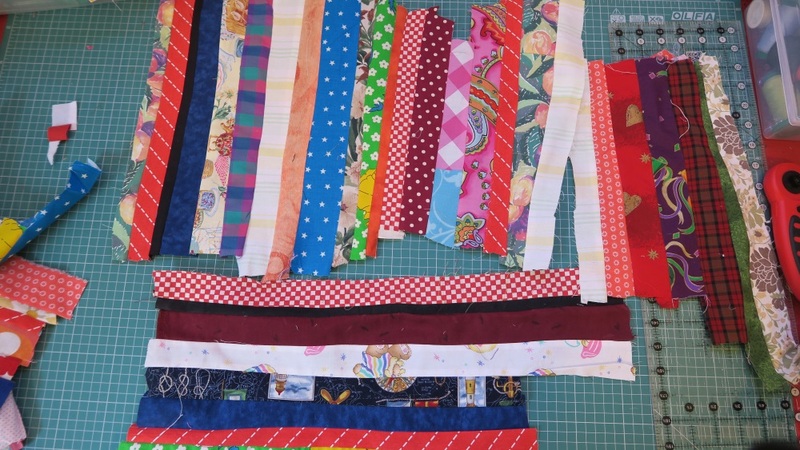 The most common choices for making these blocks are to either not use a base or to use a base to sew your strips on. It doesn’t matter what you use as your base- the method used would be the same. If not using a base for stabilization, simply sew the strings together. They will look like this: Trimming them to make a diagonal block is a bit more complicated, but can be done. The other option is to use a base for stabilization purposes. 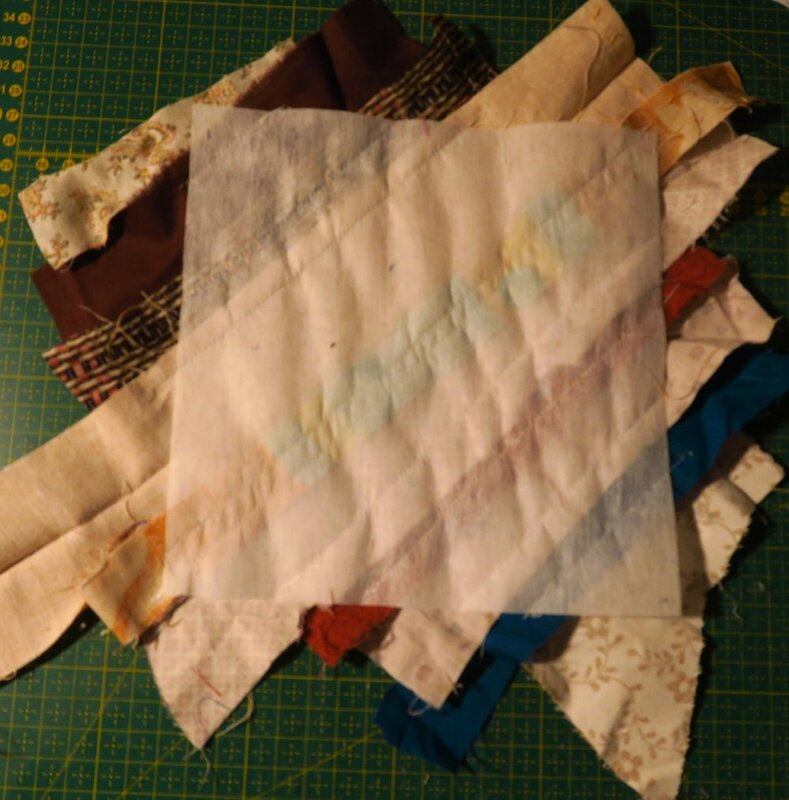 Your choices seem to be - fabric, preferably something flimsy or thin, paper, or interfacing. There are pluses and minuses for each choice - but that’s not my point here. I want to show you how to make the block. The method will be same no matter what base for stabilization you use. 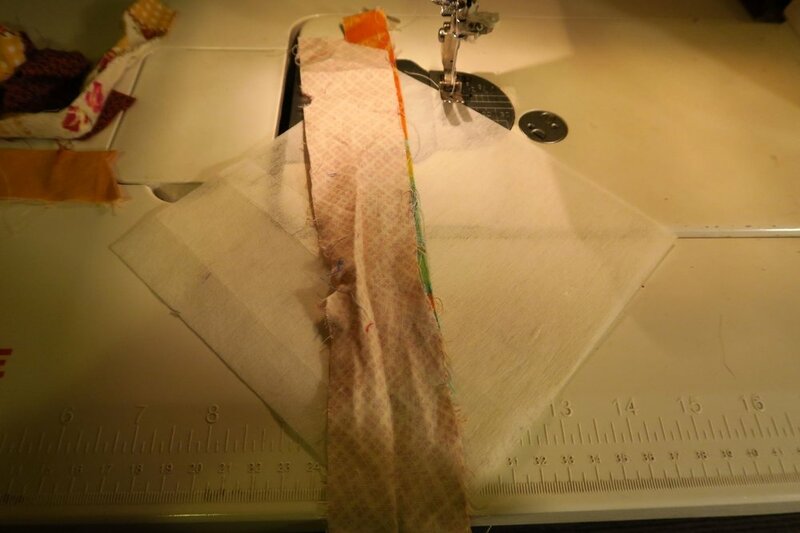 I will show mine using interfacing. This is a cheap, nonwoven interfacing (not fusible!). First, collect your strings. Follow the pictures I took for you as I made this block. This diagonal block seems to be the most common style of strings blocks made. Lay your string diagonally across the block like this. Place a second strong right sides together on top of the first one. Stitch along ride side. 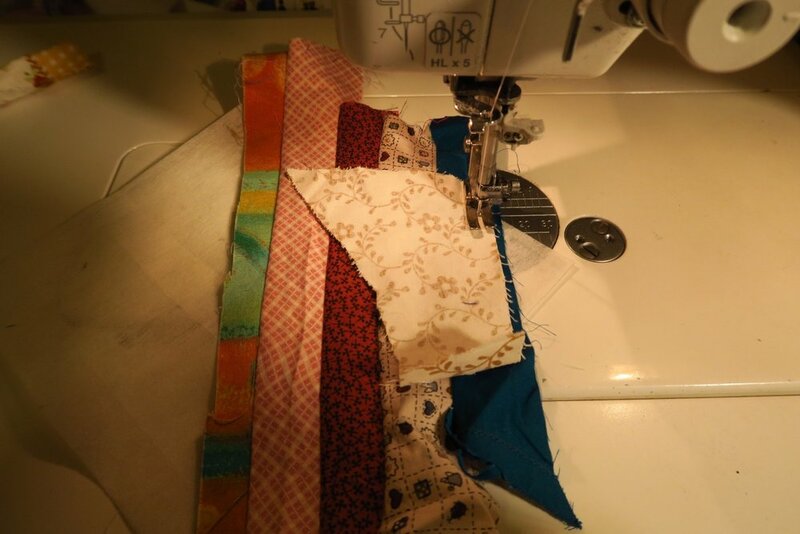 Keep adding strings until you get the interfacing covered when you open the string back up. Flip the block around and begin working from the center out. Stitch the strip to the edge of the previous one. Open out the strings and pull tight as you sew the next strip on. Keep going. I like to vary the widths of the strings. Sometimes a skinny string is just what you need for a little interest. Use small and wide strips for interest. I turned mine over to make sure the interfacing was all covered. Trim. I flipped this one over to the back, but you can trim from either side. Trim again to make a square. Finished block. This is the most typical way to make a strings block. You can make strings blocks that are not on the diagonal. Make them up and down: The problem is, they are a bit harder to use than the diagonal ones. They are somewhat harder to make as well since all strings have to be long. With the diagonal ones, you can use longer and shorter strings. Here are two pictures of some string blocks made not on the diagonal. I hope these pictures help you understand how I make these blocks. If something isn’t clear, just ask about it in the comments. Don’t forget to check out what my sis has for you in the store! She’s keeping busy keeping you in fabric! Items used in shaving, including talc, scissors, a razor, brush and more on a background of tan. Nice fabric. Perfect for quilting. This fabric features soccer player silhouettes and soccer balls on a lime green background with yellow, orange, red, and blue accents. This fabric features baseball bats, balls, players and diamonds on a cream background. This fabric features multiple sports including soccer, basketball, football, and golf.